According to CNN's Fear & Greed Index, market sentiment has now reached "Greed" levels after several months in the "Extreme Fear" range. It's another sign that it's time to take a serious look at the opportunities that lie in the market today. That's why I'm closely monitoring what investment opportunities can be found in the information technology (IT) sector right now. Few companies have made as many contributions to the advances of the computer age as IBM - which has been around for more than a century. So it's no surprise that IBM is at the forefront of the next great technological revolution: artificial intelligence. IBM's largest revenue source is its technology services and cloud platforms segment, bringing in nearly $9 billion in revenue last quarter. But its second-largest segment - Cognitive Solutions - is certainly one to watch. The application of these technologies is far-reaching and can touch many sectors of the market - from healthcare data management to manufacturing logistics. Last quarter, IBM's cognitive solutions segment brought in $5.5 billion in revenue - about 25% of the company's total sales for the quarter - with positive year-over-year growth. Historically, the fourth quarter is IBM's strongest. And earnings get reported in January. 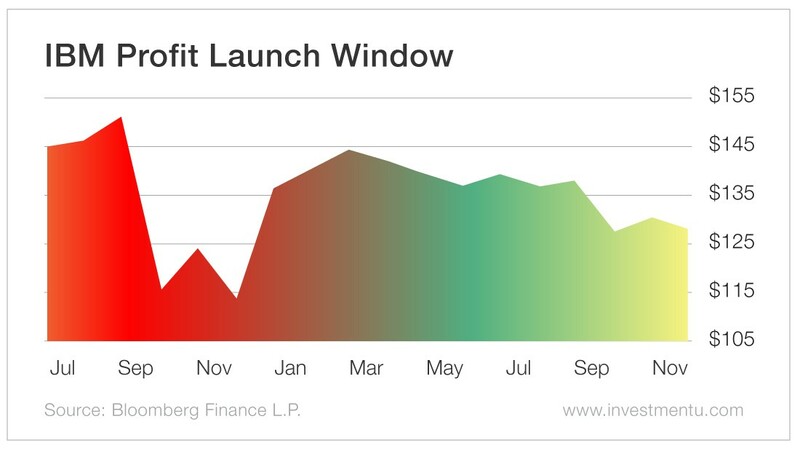 This pattern has led to a unique phenomenon that my colleague Emerging Trends Strategist Matthew Carr identified as a stock's "Profit Launch Window." It's the cyclical period in a stock's price history that produces the strongest returns. As a great blue chip in technology - as well as a smart way to play the booming AI industry - IBM is looking like a fantastic "Buy" right now. P.S. To learn more about Matthew's Profit Window System - and to discover which stocks could hand you $100,000 in the next 12 months - click here now.